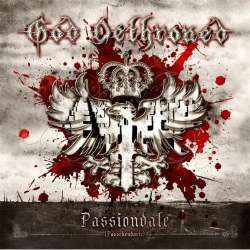 Three years after The Toxic Touch, Dutch band God Dethroned led by guitarist and vocalist Henri Sattler is back with their meanwhile eighth album Passiondale. As we are used from them, the line-up carousel has been turning again, giving us this time a new second guitarist and former drummer Roel Sanders who, after a couple of years of abstinence, is now back on board. The cover artwork lets us guess that God Dethroned play it rough this time, and the numerous breaks remind of their early days like The Grand Grimoire (1997). Those expecting only blast beat parts will be mistaken. There are lots of piercing guitars and fast double bass drum rolls, but even when the instruments give the impression of being mistreated, this never goes at the expense of catchiness. Furthermore, there are sufficiently quieter parts that we are not used from God Dethroned. On the long Poison Fog and No Survivors, the gas pedal isn’t push totally through, and we even get clearer vocals. This would disturb if it happened too often, but on those two tracks, it works to the band’s advantage and shows a hitherto unknown side that fits them surprisingly well. Behind Enemy Lines deserves also to be singled out with its unbridled parts being contrasted by elements of drone. The concept behind Passiondale deserves to be mentioned. The lyrics deal with the Belgian village Passchendaele where in World War I, English and German soldiers fought a battle that had many victims. As the English couldn’t pronounce the village’s name properly, they simply called it Passiondale. God Dethroned thus give us a history lesson of the early twentieth century, something you don’t get every day in metal circles. God Dethroned managed to fulfil all expectations and offered a very mature and varied death metal album. It’s only a shame, that disregarding the intro and the outro, there are only eight regular songs left, which is not very much considering that it took them three years since their last album. God Dethroned can count themselves still among the very important bands of extreme metal.